Hope City Church loves middle school age kids! We have developed a program to help teach them about the love of God through the gospel and even get them plugged-in to helping in all areas of Hope City. Middle School IGNITE exists to INVITE students to know Jesus, IGNITE a passion for Jesus through knowledge and experiences, and INSPIRE action for Jesus by living by his words and example. 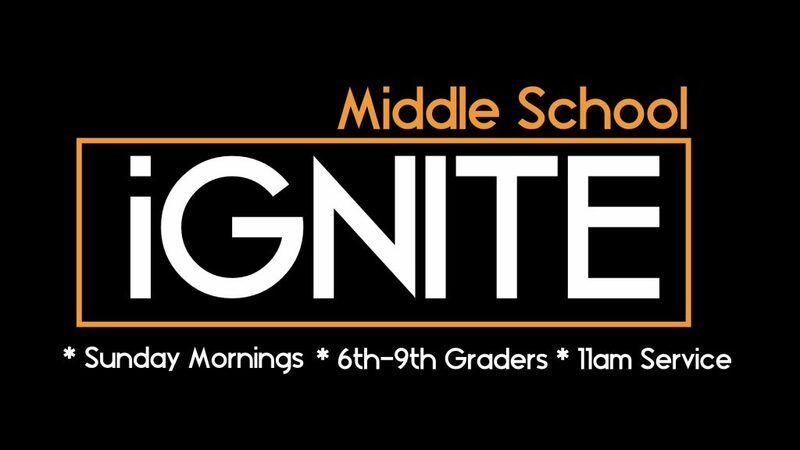 Our Student Ministry program, IGNITE, is offered on Sunday mornings and is made up of youth ages 6th-9th grade. The program consists of worship with the congregation and then a teaching and break out into age appropriate groups. Students can meet before in Theater 2 starting at 10:40am for video games, hangout, food, etc. Student ministry youth should gather up at 10:55am in Theater 2 and their leader will take them into the theater 1 for worship. After worship students will head back into to Theater 2 for a hilarious game or two, teaching, and discussion groups to breakdown the bIg Idea. You’re INVITED and we are PSYCHED to meet you!